Piglet Takes First Steps. Mummy Misses It. 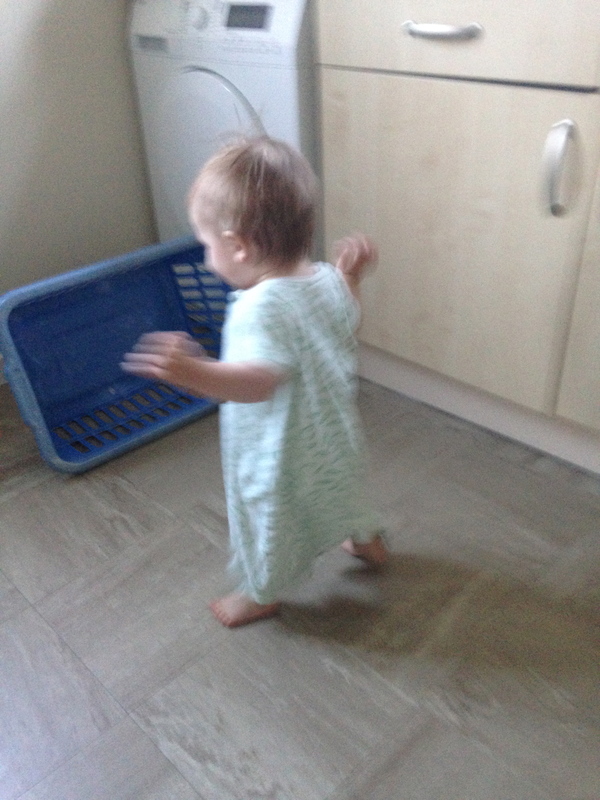 As you may have guessed from the title, today was the momentous day that Piglet started walking. I am henceforth to be found training for the one hundred metre sprint at the 2016 Olympics. After all, I am going to be running after him from now on and he is FAST. Very fast, for somebody who has only been walking since this afternoon. Look at him go! He’s all blurry and everything! And before you ask, no it wasn’t Wales. Piglet did not take his first steps in the Land of My Fathers (great-grandmothers, more accurately, in his case. The Land of Piglet’s Fathers is *technically* America), nor did he take his first steps on the M4 (put down your phones people). 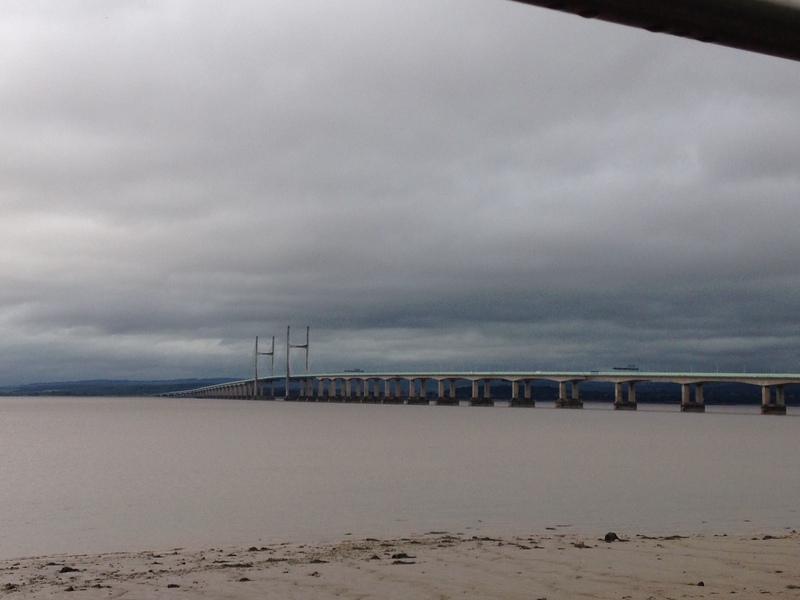 He took his first steps in a place called Severn Beach. See? There’s a beach. OK there’s no beach, but there is a River Severn, and there is also a cafe called Shirley’s Cafe, although it is the sort of place that is more likely to be pronounced “caff” than “cafe,” which probably explains quite a bit about the sort of place it is. The sort of place that, in the words of my companion, probably “hasn’t changed since 1992. Or 1942.” The sort of place where the most appealing morsels on offer are a Diet Coke and a plate of cheesy chips, and where one can purchase a second hand plastic windmill for £2, or a Jane Fonda workout video from 1986 for £3. I didn’t think the prices were terribly competitive, which was probably why we were the only customers. Anyway, my companion (my brother’s girlfriend) was looking after Piglet while I purchased our nutritious lunch, and I suddenly heard words to the effect of “ooh he’s walking!” I turned around and Piglet had literally taken his first steps, walking towards me, and I HAD MISSED IT. ALL FOR THE SAKE OF SOME CHIPS AND CHEESE. I have to admit, I did doubt at the time that he had actually walked, just like I doubted when he shouted “AJ!” at the dog in the local cafe the other week that he had actually understood that the dog’s name was AJ (why do all Piglet’s significant milestones take place in cafes? Oh yes, because we are always in them), until we were waiting at the bus stop the other day and another dog walked past and Piglet stopped what he was doing, pointed at the dog and yelled “AJ!” at it repeatedly. With bated breath, I now await the destruction of Granny’s entire house, and possibly the world, by a marauding toddler. Hahaha ‘awaiting the destruction’ Oh…… the joys of a now mobile child! Aren’t they so much easier when you can put them down in one place, do the washing up (or whatever mundane chore you need to get on with) and come back to find them still in the same place!! Long gone are those days! Ah those days…when he used to be happy just lying on his back staring into space for as much as five minutes. I miss those days! I agree, cheesy chips are the biz. So exciting that he’s begun to walk, opens up so many possibilities – in addition to the devastation mentioned! Enjoy! This is almost exactly the same as when my son started to walk, I missed the momentous occasion about three times, I couldn’t believe it! No stopping him now though hehe, all the fun starts!! Thanks for linking up to the #bestandworst hope you’ll pop by again! Thanks for reading. I’m sure there will be many more posts to come about the “joys” of a marauding toddler! Thanks for reading! He’s making up for it now. Running all over the place. And in front of me as well this time! He certainly is! Getting better all the time 🙂 Thanks for reading. Haha, I don’t think we’ve been back to that caff since. Although I had been meaning to go. The chips and cheese were fab!